I have decided to move out my Dayens Ampino separates for the time being. Without having heard the Ecstasy IVSE Stereo Amplifier, I have to say these are my favorite products they make. They are 60 watts per channel and dead freaking quiet. Electrical noise floor is nonexistant and what you hear is much better clarity and separation in the soundstage. They are able to create this experience by using very high quality transformers from none other than Trafomatic. For those who don't know the name, they are yet another Serbian company that makes very high end single-ended amplifiers. These are highly transportable units as well, coming in at about the size of a shoe. For those who like the Ampino Integrateds or the Menuetto, this is a huge step above those units. Retail on these is $1,700. I'm asking $1,300 shipped. Note that the pictures on my website are of the older version. See pictures below for actual units. These are great and they are the size of a shoe box unless Skip has humongous rectanguloid feet. Dunno I've never seen him. I purchased a new pair of these monoblocks from Skip and I've been using them for nearly a year now. I've been slowly gathering my thoughts and waiting to write a review until I've had a full year of time with them. That's the level that these amps are at, in my opinion. They deserve a review after a lengthy evaluation, not just a few weeks of listening. They have an effortless, airy, inviting, and accurate sound to them, leaning slightly toward the warmer side. They aren't forceful and strident, they are inviting and pure. They do great justice to all the genres of music I've tried with them. As Skip mentioned, they are literally silent in operation both physically and their low noise floor. They're designed to have the shortest and cleanest signal path, with the least amount of extraneous fluff between you and the music. Even the power switch has the least invasive implementation on any product I've ever experienced. No muting relays, no standby mode, etc. Top quality components inside, designed to enhance your music experience. One of the coolest things in my opinion is how Dayens listens to each and every amplifier they make. They don't ship it out until it's passed their listening tests and they sign off on it. You just can't say that for Parasound, etc. If NAD is a European sedan like a Volvo or Audi, Dayens is an English sports car like a Lotus or McLaren. There's "more" to it, there's "more" there. More of what exactly? It's hard to describe. Just like if you had to describe the difference between driving an Audi and a Lotus. There's just something there that will appeal to those who prefer a more visceral and involving experience. Also if anyone thinks that 60wpc isn't enough, I've cranked these up to uncomfortable levels for extended periods and the sound is still 100% crisp and clean with impactful bass performance. And even at these levels they still never get above lukewarm to the touch! These would be a great amplifier choice for someone looking to experience for themselves that not all amps sound the same. I guarantee these will sound different than what you're currently using, and it'll be an enlightening eye opening experience. @Clipdat That's what I said. Playing my Ampino Monoblocks right now and they're sounding sweet! I've got the integrated upstairs in the spare room. It sounds exquisite, not exactly an audiophile term, but yes it sounds great. Curious how much an improvement the monoblocks are over the integrated. i heard the monoblocks on the polk 707's and it was a good match. the thing about the monoblocks is you get to pick the preamp and mold your sound. The monoblocks are massive upgrades over the Ampino integrated. It’s a different class of sound. I used the Ampino integrated amp for quite some time with the Ushers and, at lowe(er) volume levels it really is a beautiful piece of equipment. However, since it doesn't belong to me, I am reluctant to push the unit. I had the good fortune to find some albums at my family's house while visiting over the Thanksgiving holiday. Some of these albums I remember quite fondly from my youth. When I got back to St. Louis, I cleaned up the original motion picture soundtrack vinyl album of 2001 a Space Odyssey and I played it. Disappointing is the word I would use to describe the way the classical music fares through the Ampino integrated to the Ushers. I had the volume level very close to 12 o'clock (definitely past the 11 o'clock position) and the Ampino integrated was not able to project the sound to satisfactory levels. Please understand that I live in an apartment and I don't usually go to crazy with the dB levels when listening regardless of the source material or equipment in the chain but the Ampino integrated just didn't get the job done. Despite being the upgraded version with the Mundorf caps and the WBT binding posts plus the Alps volume dial, she just ran out of steam very early. Perhaps 25 wpc just isn't enough. I immediately hooked up the Cary pre and the McCormack amp and the music came alive. It was dazzling and powerful while being subtle and nuanced at the same time. When I first got my hands on the Ampino integrated, I thought it was brilliant. THe sound it produces is so good, I put my Cary & McCormack up for sale hoping to "upgrade" to the Menuetto. After the ever so brief disappointment with the Ampino integrated, I question whether or not the Menuetto would have the power to perform at the same level as the combo I have now. I am very fortunate to have had the opportunity to try out the Dayens Ampino integrated in my stereo setup for such an extensive period and to get to know the capabilities along with the sound signature. Again, I get concerned when Skip & Sean say things like the Menuetto is a huge step up from the Ampino (so the Ampino isn't a good representation of the Dayens sound?) and then the Ampino mono blocks are a vast step up from the Menuetto (so, how can I get an accurate idea of the Dayens sound if each model up the change is so drastically different from the one below it?). I guess what I'm getting at is that it would be very difficult for me to take a blind leap of faith into the Dayens equipment without knowing how it will fare with my current setup and listening room. Regardless, my budget for this possible upgrade was very specific and very tight. I cannot afford the mono-blocks, plain and simple. The Menuetto would have been it for me but, now, I'm seriously concerned that it would fall short compared to my current separates. As such, I have reconsidered the process of downsizing to the Menuetto integrated. I sincerely apologize for derailing the thread with my thoughts here. 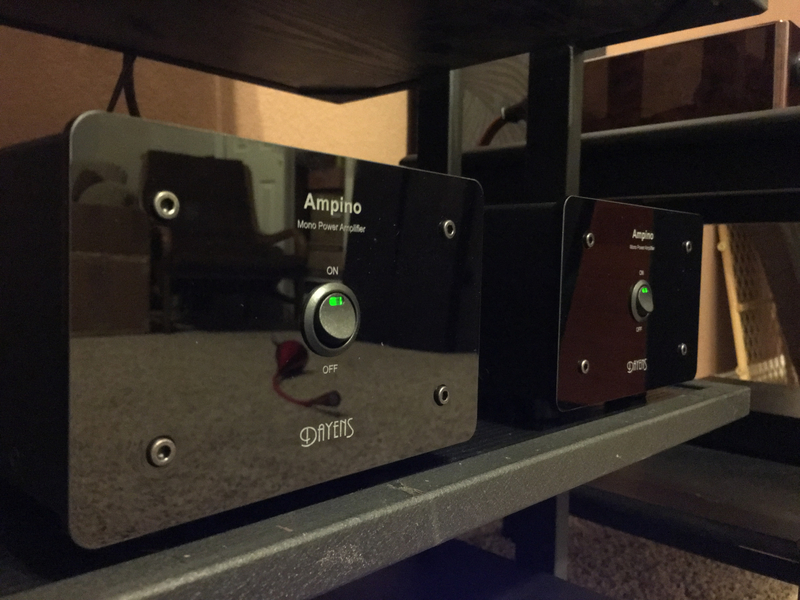 What I have to say about the Dayens Ampino integrated amp in my setup is not all bad by any means. I'd imagine that, moving up the chain will yield more power and more refinement in the end product/sound quality. Given my limitations, it's not something I'll be finding out anytime soon. Additionally, I put a lot of stock into what Drew (Clipdat) has to say about audio so, if they are exceeding his expectations and, if they are within your means, I have no doubt you'll be satisfied with them. GLWTS Skip and thank you for your thoughts Drew. 1. You do realize this is a for sale thread, right? 2. Companies have different products at different classes. While some brands have similar tonal balances as their house sounds, some don't. In this case, Dayens' 'house sound' is that of a black background with almost no electrical noise to smear the imaging. 3. The Ampino is not the right fit for the Usher CP-6311, even with the Mundorf capacitors. This is a warm amplifier that will not bring out the abilities of the CP-6311. The Menuetto is very neutral and works well with these speakers. With that said, I've driven my own CP-6311 very well with the little Ampino, but it wasn't the right fit tonally. In fact, I've driven the CP-6311 with multiple amplifiers under 30 watts and each one did a great job on these speakers. Your space might be more challenging though. 4. As has been discussed various times on this forum, where the volume pot is situated does not indicate a lack of power. Different albums have different levels. On some albums via tidal, I can easily get to 3:00 on the dial. This is an issue of gain, not power. 5. As far as products in the lineup, the Ampino Integrated is very warm and engaging with some good current behind it. Where it falls short is in soundstage limitations. The Menuetto does great with the soundstage but is more neutral in tone. It adds many more hifi qualities into the mix. The Ecstasy Integrated is an exceptional unit that seems to blend both of the previous integrateds' strengths and none of their weaknesses. It also throws in a healthy dose of power. The Ampino monoblocks, while only being half the power of the Ecstasy, offer even cleaner and purer sound and integrate well with any system I've put them in. These units are by far my favorite Dayens products, but I admittedly have not heard the Ecstasy power amplifier. Yes, I do. And I mentioned that several times in my response Skip. Well, it was an experiment on my part. Nothing ventured, nothing gained. Well, since the Ampino integrated doesn't belong to me, I don't feel comfortable pushing the volume dial past 12 o'clock out of concern for my speakers and the integrated. OK. This last bit is very good info on the Dayens products and, I'm sure, will benefit those looking for a comparisson of the products in the Dayens lineup. I know this was helpful for me. Thanks Skip. I can't wait to try my Dayens monoblocks with my LSiM 707's! In a year, and a half if I aint dead by then.